With regret I announce that my time teaching is coming to a close, with my departure back to the United Kingdom growing closer I want to look back over the last six months. My final semester may still have two and a half weeks left but already its been very eventful to say the very least. From making countless crafts to hosting another Children's Day show, it's been ace! Fresh from my Spring Festival break to Harbin and Shenyang, I was raring to get back to work to begin my final semester at my private Montessori bi-lingual kindergarten. Optimistic and ready I was set on the finish date! The stakes were high, well I had a new colleague who would be joining me in the coming weeks and I had a mountain of creative things to complete before she would be arriving. My former colleague Mark was about to move on to focus on his studies, we had worked together really well during the first semester and I was going to miss him! Getting back into classes was fine, it would be several months before the next national holiday so I got stuck in with what I needed to do! 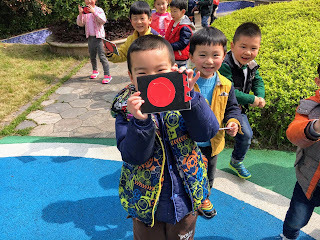 Spring flowers were all the rage with the Bridging children, we explored different writing tasks and we made the best of the pleasant weather. Let me say my two Casa classes were about to get a lot crazier! I was ready for those challenges! Like a flash February turned into March and before I knew it was already April, the first three months of this spring/summer semester were going by so very fast! Pressing pause for a moment I gave my Bridging kids the opportunity to make their own 'EKON' cameras to take some imaginary photos of the garden at our kindergarten, we focussed on words such as; leaves, flower, tree and stem. The older children absolutely adored snapping make believe photos of the said vocabulary. It's a moment during the semester that I won't ever be forgetting. Class observations aren't the most natural of things but with time I'm not filled with dread anymore when my manager watches my classes or the academic leader for that fact. Just half way into the semester I had my final official lesson observation, I chose Casa 5 or Bridging 2 because their lead teacher is amazing and the children are more used to complete English direction from me. The official observation went well, it felt so amazing! April took me away from the campus for the first national holiday since the celebrations of Chinese New Year, choosing Hangzhou was the perfect way to enjoy 2017's Tomb Sweeping weekend. 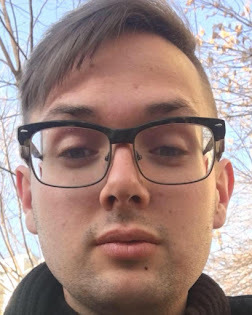 Like any other semester I was getting busier and busier, resting on my laurels for a second I had a surprise sprung on me, the new after school program had been pitched to the parents and that interactive English class would begin the next Monday after dismissal time. The Elitekids program threw up major technical challenges but within time they were ironed out. Through the chaos it kept me on my toes and for that I'm proud of myself for getting on with what I needed to do! Resilience is needed to succeed in this job, working in China isn't easy and getting emotional doesn't solve anything because things don't work like that here. I have learned to get on as best as I can with what I've got in front of me! Yes, another holiday was near! 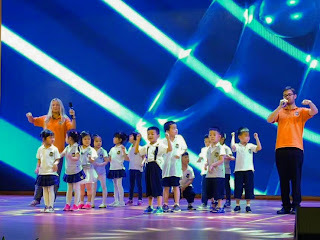 Back from Tibet it was time to get our act together for the Children's Day Show, I was in charge of my after school classes performance but I'm no choreographer so I had some assistance with that. 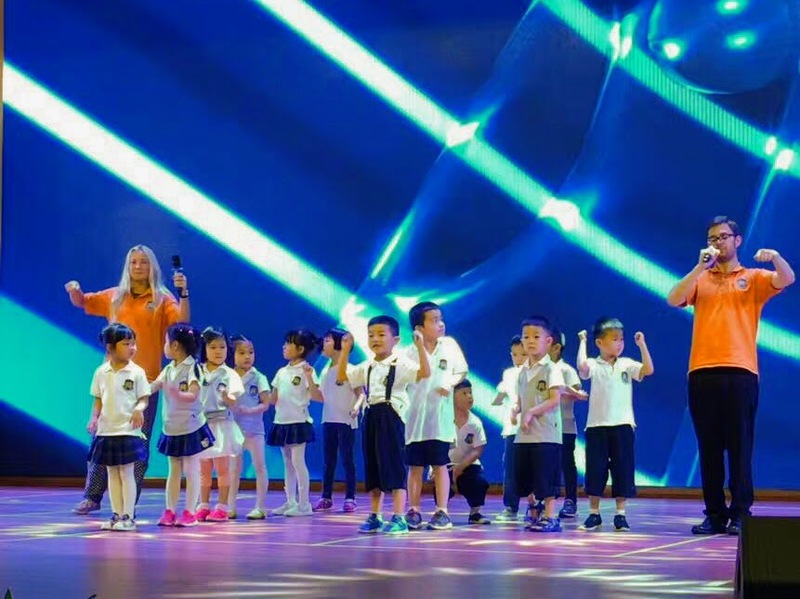 The kids knew what they were doing and we had rehearsed a fair bit, the classes took a back seat during that time as the show is really important in the eyes of the school as the parents always seemed impressed after the event, they just want to see their kids shine! I was the co-host for the show as well as leading the primary English performance. The boys were led by me and the girls were led by Charlotte, finding her feet quickly and against all odds our rendition of 'The Music Man' was amazing on the night! I was eager for classes to continue as normal, with the clock ticking during the month of May I was getting closer to completing my time in Wuhan as an English Specialist, of course I still had work to do! I was a mentor, I had wisdom and techniques to pass on to my new colleague. Work! The house had to go, I glued for my life a flower extravaganza for the spring season. Like everything it had to change and I'm not one for rushing a masterpiece, getting my storyboard design ready I worked with the materials I had and being truthful I'm getting to grips with non-teaching duties that comprise my job description. 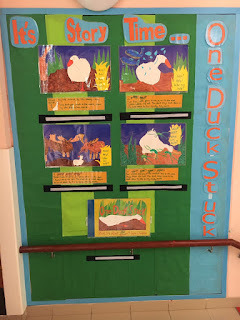 I never envisaged putting together displays before finding my chance to shine at Etonkids. Getting my storyboard on I finished this project with a few days after a last surge of energy. Putting those pages together by hand was actually fun! Charlotte helped with the fourth page, getting her more prepared for September. 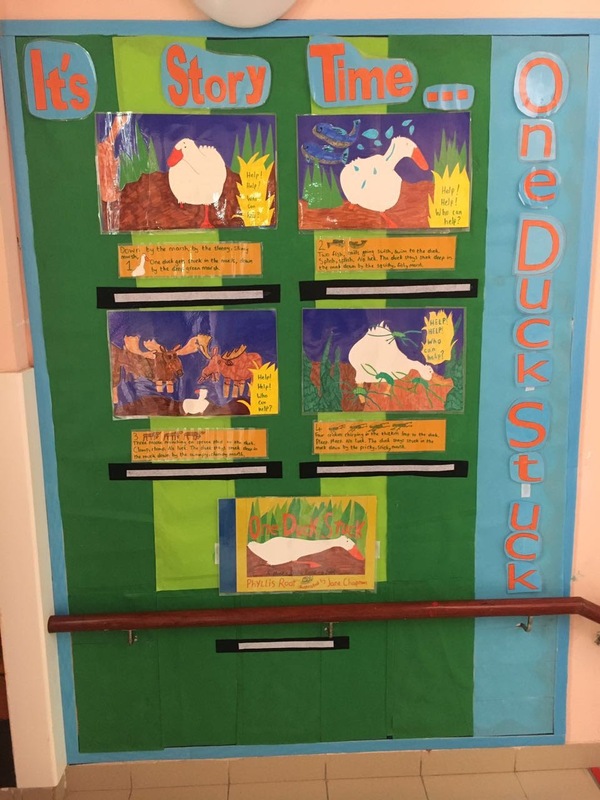 From where I stood I felt immensely proud of my efforts, that 'One Duck Stuck' display was looking on-fleek Wu! Parent showcases have taken awhile to get off the ground this semester, lots of the children from the second Bridging and other Casa classes were absent with illness, the changing weather and the last four months had been tough for the kids. Getting two Bridging classes viewed it was nice to have the remaining Casa classes completed within two weeks, the other Bridging class remain but I have every faith it will go to plan. For this chapter I can safely say this semester has been a blast, with less than three weeks remaining before my departure back to the UK, I can safely say that I have given it my all once again! Goodbyes will be brief, I will leave as quietly as possible because that subject isn't a topic of conversation whatsoever! Well, Hengda Huafu, I surely can say it's been a blast!